Andi Krause is currently the only certified Bowen Therapist in Nevada County. She has been practicing on people for five years and is thrilled to start helping pets now too. Finally there is a relaxing noninvasive healthcare alternative for you and your pet that works by waking up your body’s own healing response. Bowen therapy has been available and helpful on so many levels for people. Now your pet can benefit from Bowen therapy too. Until now acupuncture was the only alternative treatment available for our pets. No longer. No more needles, just relaxing soft touch. Many animals suffer from anxiety, illness, injury (bone and soft tissue) and acute chronic pain just like we do only they can’t tell us. Why not decrease recovery time from illness and surgery and just keep your pet pain free? Why not get your anxious pet off antidepressants? Why not heal a soft tissue injury before it becomes a chronic nagging issue? Healthcare options are changing giving us more alternative choices than ever before. Holistic medicine considers the whole person — body, mind, spirit and emotions — in the quest for optimal health and wellness. According to the holistic medicine philosophy, one can achieve optimal health — the primary goal of holistic medicine practice — by gaining proper balance in life. Any imbalance whether physical, emotional or spiritual can affect our health in negative ways. That’s where Bowen therapy comes into play. Bowen therapy sessions address insomnia, anxiety, lymphatic drainage/circulation, healing from chronic injury, digestive issues and eliminating toxins and so much more while crossing over acupuncture meridians stimulating your body’s own healing response. Unlike certain painful alternative therapies that move energy, Bowen therapy is the most relaxing form of therapy out there and works by not only affecting the musculoskeletal framework but also the internal organs, soft tissue and nerves resulting in enhanced function of the entire workings of the body. Currently, Andi Krause is the only Bowen Therapist certified in all advanced procedures in Nevada county. She has been practicing Bowen therapy for five years on humans and has been able to bring the many healing benefits to the community and “can’t wait to start helping our pets benefit too,” she said. 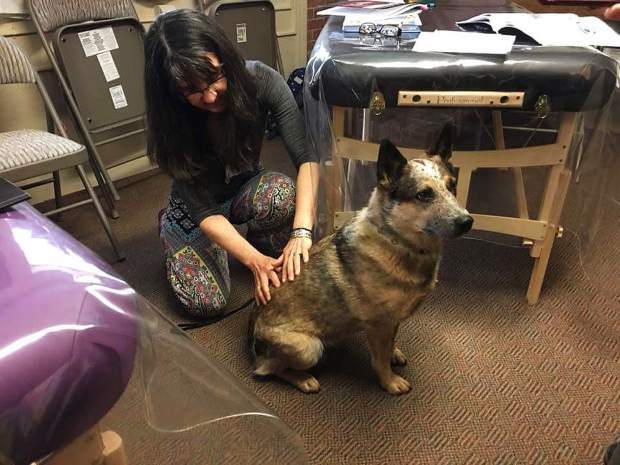 She has offices in Alta Sierra and Nevada City and is currently working with local veterinarians so they may also be able to offer Bowen therapy in the future. For more information on Krause and Bowen therapy visit her Facebook page for articles and the latest information about Bowen therapy at Bowenwork For Health and Wellness.